Earlier this year an article about Pokemon Go achieved the rare accomplishment of being shared over 100,000 times and also acquiring 70,000 links from over 800 different domains. It is an example of the magical content we all dream of conjuring up and publishing. However, such content is rarer than a unicorn or a Patronus (the mystical creature conjured up by wizards in Harry Potter to ward off Dementors). We teamed up with Majestic to look at how you can improve your content wizarding skills to create content that gets shares and links. So how do you create content that achieves shares and links, what does it even look like? In Harry Potter, Professor Lupin says only the most experienced wizards can conjure up a Patronus. It is certainly not easy to create content that gets shares and links. Last year we analysed one million random posts and found 50% of posts received fewer than 8 shares and 70% of content was never linked to. Even when we looked at high performing content we found it was very rare to achieve both high links and high shares. It is great to publish a viral post that gets well shared but shares are not enough. According to a recent study by Eric Enge at Stone Temple, links remain a very powerful ranking factor for Google. Content that achieves both high shares and links is truly magical and can significantly enhance your website and traffic. It is one of the reasons we have added Majestic‘s link data to our BuzzSumo app so you can now see the shares and links for any content article as shown below. All of these five types of content are, for different reasons, highly shareable and referenceable. In simple terms content that is research based, that answers core questions and that is controversial (within boundaries) is much more likely to attract both links and shares. The core thread that runs through all of these content types is content that is authoritative. If you want to do your own analysis, rather than rely upon our research, you can now do this with the latest version of BuzzSumo. As we noted above we have partnered with Majestic and we now show the total number of domain links next to the total shares for any article. This provides you with a more rounded view of how content is being amplified and you can see for any topic or any domain the content gaining shares, the content gaining links and the rare, magical content that achieves both. One of the best examples of the power of an authoritative ‘What is..’ post was published by the Content Marketing Institute. We see exactly the same pattern for SEO. This ‘What is SEO’ post on Search Engine Land has attracted links from over 2,600 domains. As we can see from the Majestic data below this post continues to attract new domain links every week. Not all domain links have the same value. We all know that a link from say the BBC will have more value than a link from BuzzSumo. For the purposes of this post we have primarily focused on the number of domain links but you can explore the nature of the links for each post using BuzzSumo or Majestic. The key to ‘what is..’ posts is that you have to be the ‘best’ authoritative answer, in an area where many people are asking the question. The gap between the best answer and the second best answer is significant. This is partly self fulfilling as once a post becomes the best answer it is likely to get more attention and more links, which in turn will reinforce its Google position etc. It is a virtuous cycle. However, even if you are the third or fourth best answer, your content is likely to attract both shares and links. Harvard Business Review has a large audience and their posts typically get a lot of shares and inbound links, but typically articles receive less than a hundred links, often a lot less. This post on Disruptive Innovation achieved over 4,000 external links from almost 500 different domains. We can see from Google Trends below that there has been growing interest in Disruptive Innovation which will have helped the post with both shares and links. So this article is ticking two of our magic boxes: tapping into a trend, and providing an authoritative “what is” answer. The post author is one of the authorities on disruptive innovation and hence, it is no surprise that domain links came from sites such as Forbes, Techcrunch, Business Insider, World Economic Forum, Salesforce etc. We continually see an interplay between authority and links, which runs throughout all five content types. From the Majestic tracking data below we can see that the number of backlinks and referring domains continues to increase over time, which is a typical pattern we see with answer posts. The real takeaway is not to ignore the power of simple posts that answer questions. If you are an authority in an area you should have these cornerstone answer posts as they tend to attract both shares and links. They also have longevity and continue to attract links over time. The difficulty is that to create a unicorn or Patronus you have to, as Lee Odden says “be the best answer”. This means you have to choose the question carefully in an area where you have authority or can build authority, without being promotional or biased towards a product. In our case a post on ‘what is content marketing?’ could never compete with CMI’s post. However, we could write answer posts in areas where we have some authority or expertise, for example ‘what is shareable content?’ or ‘what is a viral headline?’. In our research last year we found that opinion posts, particularly political opinions and controversial opinions achieved high numbers of shares and links. This was a surprise to us. We knew that political articles get very well shared by the relevant ‘tribe’ but we did not expect so many to get referenced and linked. Below are two examples of opinion pieces that got both shares and links. These may not seem like high numbers of referring domain links but it is actually rare for content from sites such as the Washington Post or even the New York Times to get more than 500 referring domain links to articles, despite the size of their audiences and numbers of shares. What also surprised us was that the findings didn’t just apply to political posts. It applies equally to controversial or strong opinion posts in B2B industries. Strong opinion posts appear to attract more links on average than other post formats. Don’t believe me? Well let’s look a post by Mark Schaefer. 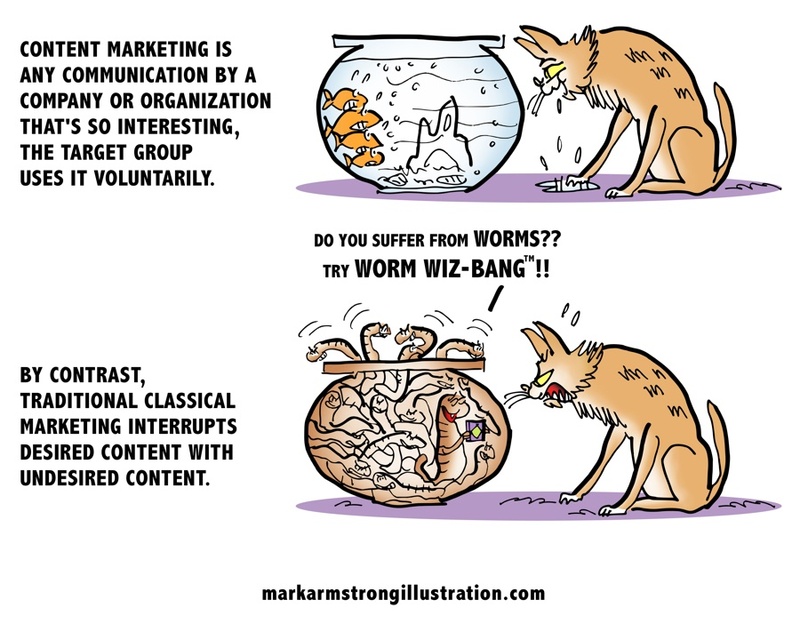 In this post Mark set out a strongly argued opinion that content marketing is not a sustainable strategy and he popularised the term content shock. This has become a seminal post and has so far been linked to from over 900 different domains. To put this into perspective, Mark’s blog posts typically attract between 10 and 20 domain links. In total his blog has links from 1,600 different domains. Thus this one post attracted more than 50% of the total domain links for the site. I tested this opinion approach in a small way myself with a post in September on ‘why the future is more content’ and why quantity wins out over quality content. I was deliberately being a little provocative. So far this post which is only a month or so old, has attracted 136 links from different domains and it is continuing to attract new domain links each week. Opinion and controversy does not only generate news and shares, it also attracts links. There can be risks but controversial posts can play an important role in your content strategy. It has been clear for some time that original research and associated reports are much better at acquiring links than say list or viral content. This was confirmed by our analysis of content with high shares and links, the content format that appeared most consistently as we filtered articles was research based posts. The classic example of a site that gets consistently high links as well as shares is Pew Research. In the example below, the post received 8,000 shares which makes it their tenth most shared post this year. However, it also received a very high number of domain links and it was cited by many major publications such as Harvard Business Review, the New York Times, Washington Post and many more. The example above is from a respected research organisation and it is clear that authority matters when it comes to links. We will discuss this further below. However, secondary analysis of respected research can also perform well. In October 2015 the International Agency for Research on Cancer (IARC) classified processed meat as a ‘definite’ cause of cancer and red meat is a ‘probable’ cause based on latest research. This research was well covered by the news media and Cancer Research UK wrote up a post on what people need to know based on the research. This post was very well shared. We should note that warning style posts like this are typically well shared, which may have added to the shares in this case. The post also achieved over 600 domain links. The combination of these factors — namely latest research findings, a focus on personal health, and a warning to the public from a respected site, helped this post become very well shared and linked. As we saw above, political posts, particularly controversial posts, can achieve very high levels of shares and links. Original political research is another particular niche that also gets a lot of domain links. We can see this with the research conducted by Five Thirty Eight and in particular their election forecast. This particular content, which is regularly updated, has more domain links than any of the other examples we have used in this article. Why? It’s often controversial, taps into a trend many are obsessed with, it’s political, authoritative, provides insights, and is data-driven research. Close to a full house on the magic boxes. And that’s how you get 1m shares and over 3,000 links. The above examples are consumer based but the same principles hold true for B2B content. Many B2B websites conduct their own original research surveys and typically the reports from these surveys acquire far more links than other content on their sites. For example, many of you reading will know Social Media Examiner. This popular site frequently publishes practical content such as ‘how to’ posts that get a reasonable number of shares and links. However, their annual survey research report significantly outperforms when it comes to links. The latest industry report was one of the most highly shared on Social Media Examiner but as we can see below it also received ten times the domain links of other content with similar levels of shares. I believe this is because the report is based on original research which makes it referenceable to anyone writing about the social media industry. Another example of B2B research was our survey with Moz last year looking at the correlation of links and shares. The results were published on the Moz blog and achieved over 600 domain links. A shorter version of the research “50% of content gets less than 8 shares” was also published on our own blog which achieved 235 domain links. That number is high for a small site such as our own. Research can be published in various forms such as guides, for example a guide to search engine ranking factors. These guides become highly linkable and shareable content particularly when they get regularly updated with annual research results. Original research based content has the potential to achieve much higher numbers of domain links than other forms of content. You can review, comment and add value to original research conducted by others or you can conduct your own original research. In my view regularly updated research content should be part of any content strategy. It builds your authority and can become cornerstone content that is referenced by your industry. My one caveat is that the research needs to be in-depth and serious to have credibility. That can take time to build. 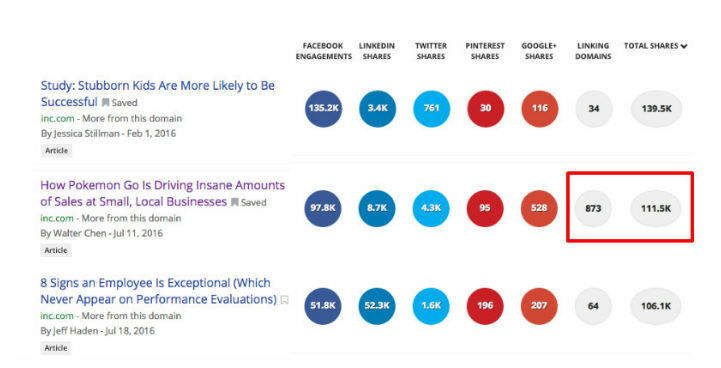 We all know that trending topics tend to do well when it comes to social shares. However, posts about trending topics tend to explode quickly and then die. While they still have value in raising awareness they often achieve few links and don’t generate long term traffic. For example, an article on a Game of Thrones plot twist attracted over 15,000 shares but did not achieve a single link. So newsjacking isn’t a sustainable content marketing approach. The way to leverage trending topics to attract shares and domain links is to add value through insights or practical tips. One of the best examples we came across was this article on how Pokemon Go is driving insane amounts of sales at small, local businesses. Walter Chen’s post was one of the most shared on Inc this last year. It wasn’t top but it was in the top ten. However, in addition to achieving over 100k shares it also acquired links from over 800 different domains and over 70,000 external links in total. The other top nine most shared posts on Inc averaged 70 referring domain links. This is high but Walter’s post was in a different league. The post was timely, being published on July 11th, when there was huge publicity around the Pokemon Go craze. However, there were hundreds of posts published about Pokemon Go. For example, this post on “8 reasons why Pokemon Go is the greatest game ever” published on July 12th. This post got 114,000 shares but only 23 domain links. Walter Chen’s post was timely and leveraged a trend, but more than that, it put the game in a business context. It also promised case studies and data backed insights on how to local businesses could use Pokemon Go to improve sales. This caused big influencers, such as Marc Andreessen and sites like Hacker News to share the post, helping to amplify it. So what works in this post? This is almost a roll call of the sites you would want to link to your article. In terms of shares the post’s headline followed a classic viral, five element format as we can see below. The post was effectively a ‘How to’ post about improving sales with case studies. The emotional hook was provided by the word ‘insane’. The promise is to drive sales and of course the topic was Pokemon Go which was already trending. The real power however, is not the headline but combining practical insights around a trending topic. Another good example is this post from KD Nuggets. The post combined machine learning and data science, very popular trending topics this year, with practical tips and insights. The post received over 3,000 shares which is very good for this particular site, but the number of links was sky high at over 800. No other post on the site got over 100 domain links. Another variation on this approach was this post from Back Channel on how Apple is using AI and machine learning. This post also achieved high shares for the site and a very high number of domain links. A final example is this post from Search Engine Land on Google’s algorithm RankBrain. This FAQ post promised to provide a comprehensive overview of what was a new trending topic in the SEO world in 2015. Combining practical and valuable insights with a trending topic has the potential to create a magical post that generates shares and links. Trending topics by their very nature will be the subject of hundreds, if not thousands of articles. To differentiate your content and to leverage the trend effectively you want to be one of the first articles that provides provide case studies, insights and practical advice, whether the topic is Pokemon Go, Machine Learning or RankBrain. One approach that works here is to focus on a specific audience and help them make sense of and leverage the trend. For Walter Chen at Inc the key was to focus on small, local businesses. That gives your content benefit to a specific audience, and makes it easier to build authority. New versions or enhancements to popular products such as Google, Facebook or smartphones, are of interest to a very large audience. It is therefore no surprise to see such content get well shared. Typically this content burns brightly for a few days and then dies. However, authoritative content about these new developments can become a reference article which then receives a high number of domain links. Below is an example from the BBC about Apple dropping the traditional headphone socket on the iPhone 7. The article received 32,000 shares which is outside of the top hundred most shared articles for that site but nearly 2,000 domains linked to the article, making it one of the top BBC articles for links. This example is a consumer article about a very popular product and obviously the BBC is also a very popular site but the same principles apply in B2B marketing. Here is an example from Search Engine Land about Google developments. This article was about Google no longer showing ads on the right hand side of desktop search results. The post starts ‘Confirmed’ which almost gives the article an official status which may have encouraged people to feel comfortable about linking to this article to share the news. However, Search Engine Land is also a respected authority site when it comes to SEO, and it is has built trust with its readers which encourages them to link to SEO news articles such as this one. Very few sites have the authority to create an article that becomes the definitive news story about a popular product development. However, you can build a reputation within your own industry for consistently covering breaking news about products and companies. Like many things in content marketing this is not a quick win, as it takes time to build your reputation. As with leveraging trending content, it helps to focus on a specific audience or sector, and review the product from their perspective – which features of the new Mac will make life better for developers, gamers, etc. I think this is one of the more difficult areas for companies wanting to generate content that gets shares and links but it could be an opportunity if you provide regular news updates and briefings, or have an audience that looks to you to review products from a specific use case. Content that achieves both high shares and domain links is very powerful and has the potential to be cornerstone content for your website. By its nature such content is rare and difficult to create. All of these five types of content are, for different reasons, highly shareable and referenceable. Hopefully we have provided you with some useful ideas on how to conjure up your own magical content that will achieve both shares and links. First, congrats on launching the great new feature! Having a number of links next to shares is great for measuring the content performance. Second, your findings look really helpful. And I guess with the new BuzzSumo feature everyone will be able to perform similar research for their own niche and industry. Two things really jumped out for me: the importance of establishing one’s authority, and writing for a specific audience. The viral 5-element headline format was new to me– fascinating and very helpful. Two great UK companies Majestic & Buzzsumo! Hi Sam, thanks, much appreciated. Really looking forward to working closer with Dixon and the team at majestic. Hi, Steve! Very Informative article! The possible five points lead to a high number of links and shares across the web. The controversial and research related articles are in high demand to get shares. Soon we will try “B2B Industry Research” tactic at http://www.saasgenius.com after it I will let you know, if it was successful! LocalBook is global Premier Online Business Directory! It is also intended to become world’s most accurate directory. This is a great article. Very informative. I have a lot to chew on now! Thanks! When you experience something amazing that you don’t understand, you call it magic. But when experience the same thing that you understand very well, you call it science. But no matter how you see things as long as you got great results, just how I feel with this blog, the feeling is magical. I may have to check out Majestic a little more myself. Very good! Interesting perspective about content creation.